Damien Chazelle’s follow-up to La La Land fragments into a stream of dramatic particles orbiting around central star, Ryan Gosling. I love space movies. If Apollo 13, The Right Stuff or Contact happen to be on TV, I can’t help but watch, even if I’ve seen them all a dozen times. At least. Same goes for Carl Sagan or Neil Degrasse Tyson or any astrophysicist, astronomer, or quantum engineer. I’m pulled to their intellectual mass and moved by their gravity. They always see the biggest picture possible. That said, I didn’t love First Man. Perhaps, because it remained so focused on the small. Seeking to dramatize Neil Armstrong’s personal journey that took him to the moon and back, the film stretches from 1961 to 1969, beginning with Armstrong’s training as a test pilot and ending with his monumental feat on Apollo 11. It’s a lot of calendar time to squeeze into a movie, and Chazelle stretches the running time to two hours-plus. With so much to process, First Man fragments into a stream of dramatic particles that orbit around the central star, Ryan Gosling. The granular approach certainly works when it comes to setting the period mood. Everything in the frame is perfect mid-century America. Even Linus Sandgren’s images feel retro-correct, with their saturated colours and soft-focus edges. The particle theory also works when it comes to establishing Neil Armstrong’s unique character, which was a complex combination of elements, and deserves to be understood on a molecular level. The movie actually sets foot on parts of Armstrong’s past we’ve never seen before, beginning with the death of his daughter. Chazelle uses the tragedy as the emotional launch pad for the whole narrative arc, setting an ominous and lonely tone from the very first note. In some ways, the existential angst fits the lunar landscape and the reality of the space endeavour, but like the isolated shooting style, it also drains the movie of forward thrust. So many scenes seem to hang weightless in the void, circling known history without delivering the iconic or expected. You may think you know where you are in the story if you know your space stuff, but Chazelle wants to play it like a thriller. In some ways, the existential angst fits the lunar landscape and the reality of the space endeavour, but like the isolated shooting style, it also drains the movie of forward thrust. So many scenes seem to hang weightless in the void, circling known history without delivering the iconic or expected. Fair enough, but you need a few dramatic boosters to build suspense, and he keeps going for the understated, up-close, documentary approach. He also decided to go for interior shots. He wanted to give us the insider’s view of a capsule and a cockpit, but that turns all the action scenes into a nauseating, jiggling blur. The movie finds its strongest moments in the scenes between Gosling and Claire Foy, who plays Janet, his wife and partner in grief. The two have fantastic chemistry that stems more from intellectual respect than anything specifically sexual. She understands him. She knows what’s inside his head, and in order to really get at Neil — a man of very few words and limited outward expression — we needed more of her, more of them. 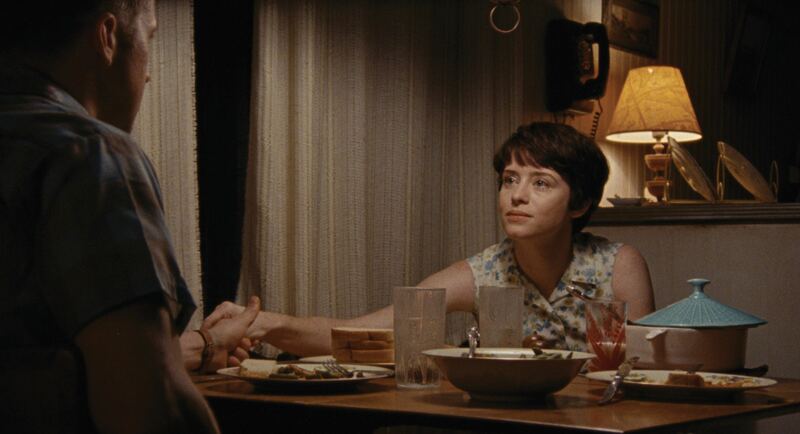 The Space Between: Ryan Gosling and Claire Foy play Neil and Janet Armstrong, ordinary people turned into living history in Damien Chazelle’s First Man. Daniel McFadden photo, courtesy of Universal Pictures. The best scene in the film is an example of where small shines: Janet asks Neil about his day in a typical Laura Petrie tone. At first, he’s monosyllabic. But she nudges for more, and he tells her about something he thought was “pretty neat.” I’d tell you what it was, but I don’t want to ruin the surprise. Nor do I have a degree in physics or engineering, so I didn’t really understand what it was. What I did get was a sense of who he was, what made him excited and the dynamic he had with his wife. Main photo: Ryan Gosling as Neil Armstrong in Damien Chazelle’s First Man. Photo Daniel McFadden courtesy of Universal Pictures. No Replies to "First Man makes small steps, fails giant leap"